Early start for all on Saturday morning, F1s to load plus the Ministox. All racing at the same meeting, which makes life a bit easier. It’s Phoebe’s turn to clean out the truck and she now wishes she had done earlier in the week! Frankie JJ has to clean out the back of the truck, lots of sweeping required, he also helps me to load up. Samantha arrives with bacon butties for all, keeps us going until we leave, hopefully at 1.30. Arrived at Coventry, and lots of manoeuvring required to park up the truck! Kids disappear almost immediately, the Mini pits are other end to F1 pits so they rush off to see their friends. Have to track them down as minis are ready for scrutineering. Sometimes the grading seems unfair? 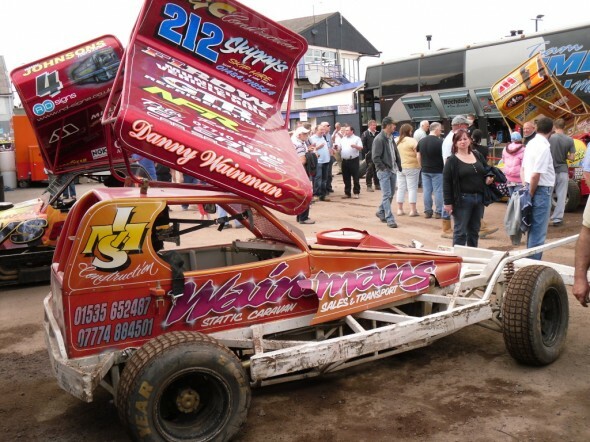 Frankie JJ starts behind drivers 4 years older with 4 years racing experience. Anyway the race starts and JJ is doing well considering he’s not a fan of shale! He finishes in 8th place which means he can start from his grade in the Final. I go out for red top race, starting from the back. Race starts pretty well, but didn’t particularly finish that way! Another driver turned right on me so this set me back, also spun out at some point, limped over the line in 7th place. A good win for Mark Gilbank. Back in the pits, both kids are already lined up ready to race, thankfully Wez and Vikki have refuelled cars and made sure their belts are on correctly. The race gets underway. Phoebe’s start isn’t the best, Frankie gets a good start. Phoebe gets going and takes a while to catch her brother, they both drive brilliant and Phoebe gets 3rd and Frankie 5th. In the pits we discover Phoebes gearbox is playing up, nothing we can do about that tonight, will just have to persevere. Frankie is grinning from ear to ear happy with his 5th position, a good confidence building meeting for him so far. Time for the Ministox Final, another slow start for Phoebe as she struggles to get her gears, Frankie going well until he gets spun out. Phoebe manages a 6th place and Frankie a 14th. Time for the F1 final. Another race when things were not meant to be, was going reasonably well then got tangled up finished 6th. We alter my car set up for the National, it felt bloody mint and was the quickest it had been all night! Had a tangle moment with Mark Woodhull and got 9th. 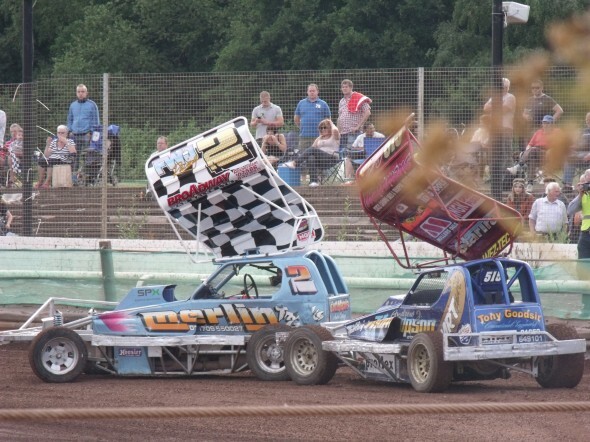 Next was the Father’s Race in ministox. A quick change of the car seat in Phoebe’s mini and I’m out for the Fathers race! I start from row 7 outside. Car felt quick and I really enjoyed driving it. And to top things off won the race. Nobody to share my driving this weekend so have to drive back. Once everyone has eaten they disappear and I can hear them all snoring! Pretty boring sometimes, we arrive home at 3.30am! Sunday, and a day off from racing! My Godson Harrison is a year old so we drive to York for a birthday celebration. The weather is perfect and Norm is in charge of the BBQ! He’s pretty good and nobody took ill? 10/10 for Wendy’s cheesecake. Great day had by all. Phoebe’s wrapped to hear she was 2nd fastest car at Coventry, just behind Hayley Williams. During the week I work on Austen Thompson’s Ministock which got a battering at the last Skegness. I’m also building him a new one so he will have 2 for different surfaces. I’ve got loads to do before I can even start on my Tarmac car for the Skegness weekend.